Review posted April 6, 2016. Candlewick Press, 2015. 32 pages. This is a fairy tale retold in “the time of your grandmother’s grandmother.” The beautiful paintings show clothing from the early twentieth century or late nineteenth century (I’m sure the illustrator could tell you precisely which). The paintings portray a Venice-like kingdom with a city set on a lagoon. The king and queen decide that to find their daughter a husband, they will look for a young man who can show them the most wonderful thing in the world. While princes and courtiers are bringing marvels to the king and queen (and here the illustrations are amazing), Princess Lucia has decided to see the city and to learn about its people. Salvatore is the grandson of Wise Old Angelo, who gave the king and queen the advice. Salvatore brought the letter, and he’s sitting outside when the princess ventures out. As Lucia came running out of the palace, she saw Salvatore sitting on the wall, playing with a little tabby cat. “Thank you,” said the princess, and they walked away toward the heart of the city. You can see where this is going! But the natural progression is carried out so beautifully and satisfyingly. The suitors bring some truly amazing things, but none of them is the most wonderful thing in the world. What the answer is, of course, is perfect. The paintings in this book are very small and detailed, though truly wonderful, so it wouldn’t necessarily work for reading to a large group. 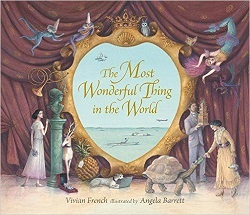 But anyone who likes an illustrated fairy tale will find a treasure in this book.